I bought a big stack of corn tortillas a few days ago….exactly 80 Guerrero brand corn tortillas. In other words, way too many corn tortillas for a two-person household. Subsequently, I have been eating breakfast tacos, lunch tacos, and quesadillas, but I have not yet seen Jesus. 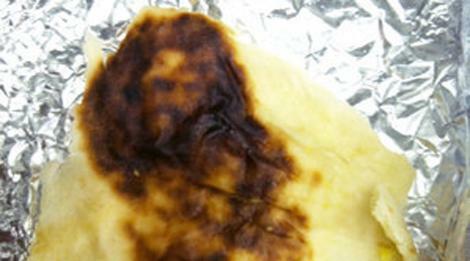 But Ernesto Garza of Beeville, TX, opened up his (handmade) breakfast taco and saw exactly that: an image of Jesus scorched into his tortilla. Personally, I think it looks more like Carlos Santana. I have at least 60 tortillas left; maybe I’ll see St. Francis or La Virgen de Guadalupe or Our Lady of Prompt Succor (it is hurricane season, after all). Or, if it’s really Carlos Santana on Mr. Garza’s tortilla–maybe I’ll see James Booker or Dr. John. If you are looking for another thing to do with corn tortillas…I like to take a pizza cutter to a stack of them and them into 1/4s and deep fry em’. Homemade (kinda) tortilla chips. I think that’s Rob Zombie on the burrito. Hmm, you’re the first to suggest Rob Zombie…someone else suggested Bob Marley. It’s a pop-music-or-religion Tortilla Based Rorschach Blot Test. Yes but does cooking over an open flame produce pictures of saints or musicians? La Virgen de Guadalupe..maybe you’ll see Fidel Castro? Diego Rivera? Correction noted….I’m looking for Che in my next tostada.